Thursday, the Supreme Court had its say on Obamacare; soon, the American people will have theirs. As a matter of law, the Court’s decision upholding subsidies for states participating in the federally run insurance exchange, healthcare.gov, violates the plain text of Obamacare. The statute expressly restricted insurance subsidies to those individuals purchasing coverage through an “Exchange established by the state.” But just as Chief Justice Roberts three years ago decreed that the individual mandate functioned as a tax, even though both Congress and President Barack Obama stated that it wasn’t, the Court decided that “Exchange established by the state” meant any type of Exchange, whether established by states or by Washington. It’s a sad outcome for the rule of law — and the English language. But when it comes to the political debate surrounding Obamacare, the Court’s ruling ultimately decides little. Of course, Obama, who took an entirely predictable victory lap yesterday, would have you believe otherwise. But we’ve seen his triumphalism before — and have seen it come crashing back to reality. Three years ago, Obama stated he wouldn’t “refight old battles,” mere hours after seven Supreme Court justices — including his own former solicitor general — struck down the law’s mandatory Medicaid expansion as unconstitutional “economic dragooning” of the states. On election night 2012, the president promised to “move forward” — months before at least 4.7 million Americans received insurance cancellation notices thanks to Obamacare. And this April, the president arrogantly declared that “the repeal debate is and should be over” — mere weeks before his native state of Hawaii shut its failed insurance exchange, an effort the federal government spent more than $200 million funding. So, much as the President would like the debate on Obamacare to be over, it isn’t. The debate persists in large part because the law has singularly failed in its prime objective: Containing health care costs. Consider why this Supreme Court case mattered so much to the administration in the first place. The law spends over $1.7 trillion on subsidized coverage to make insurance more “affordable,” largely to offset the new mandates and regulations that have raised the price of insurance. And with myriad insurers proposing double-digit premium increases for next year — some as high as 50% — candidate Obama’s 2008 promise to lower insurance premiums by $2,500 per family is further away then ever. No wonder the law remains singularly unpopular. When it comes to winning the debate on Obamacare, there is still all to play for. But in order to win, we conservatives first have to play. That means outlining our alternative vision for health care: How we would restore freedom and choice to a health care sector currently lacking for both — and most importantly, how we would slow, and hopefully reverse, the trend of skyrocketing health care costs. As I write this, I stand as the sole major declared presidential candidate (with the possible exception of Bernie Sanders) to put forward my vision on health care, and an alternative to Obamacare. As proud as I am of my plan, that is a boast I wish I were not able to make. Because Republicans, from the top down, must outline a clear and coherent vision for health care to win the trust of the American people to repeal this President’s health law. While we should be shouting our vision from the rooftops, many of my fellow candidates have managed barely a whisper about how exactly they would repeal Obamacare, or what they would do to tackle the main issue plaguing our health care system: rising costs. Sen. Mike Lee recently stated that lack of an Obamacare replacement plan should be a disqualifier for any conservative presidential candidate. He’s absolutely right. We owe it to the American people to release our plans well before November 2016, and to have a robust debate within our party about what should come after Obamacare. Because, contrary to this President’s self-proclaimed edicts, yesterday’s Supreme Court decision is not the end of the debate on Obamacare. Now that the Supreme Court has ruled, the debate shifts back to the elected branches of government — the ones that caused our health care mess in the first place. It is there that conservatives can complete our work to repeal Obamacare. This post was originally published at Time. The Congressional Budget Office released its annual update last week regarding the long-term budget outlook. In that document, one chart in particular demonstrated the financial difficulties caused by an entitlement system that has promised Americans more in benefits than it can deliver. Figure 2-5, on Page 47 of the CBO report, analyzes the average lifetime Medicare benefits and taxes for cohorts of the population based on their decades of birth. Individuals born in the 1940s will receive, on average, Medicare benefits equal to about 7% of their lifetime earnings. Those born in the 1960s will receive lifetime Medicare benefits equal to about 11% of their average lifetime earnings, and those born in the 1950s get benefits equal to about 9% of their earnings. 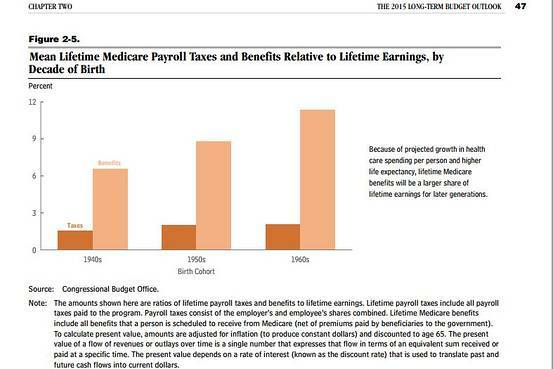 In all three cases, the lifetime benefits received from Medicare will vastly exceed the lifetime taxes paid in. Most cohorts, CBO said, will pay about 2% of taxes relative to their lifetime earnings. These findings echo reports by Eugene Steuerle and colleagues at the Urban Institute analyzing Social Security and Medicare benefits over a lifetime. Their most recent series of estimates, released in November 2013, found that a two-earner couple in which both make average wages and turn 65 in 2015 will receive more than three times as much in lifetime Medicare benefits ($427,000) as they paid over their career in Medicare taxes ($141,000). It’s noteworthy that the dedicated Medicare payroll tax is not the program’s only source of financing. While Medicare Part A (hospital insurance) is largely funded through the direct payroll tax, general government revenues fund Medicare Part B coverage of physician services and Part D coverage of prescription drugs. In other words, most individuals fund Medicare through revenue sources beyond their payroll taxes—namely the income tax— even if quantifying the size of that contribution proves more difficult. Still, the CBO chart illustrates two major forces squeezing Medicare: Rising health costs and longer life spans are increasing the benefits paid, and average promised benefits do not remotely equate to average contributions made—undermining the principle of a social insurance model. With about 10,000 baby boomers on track to retire every day for a generation, these two trends will define our fiscal future. Policy makers would do well to address them sooner rather than later. In a Think Tank post last week, I wrote that in trying to sell Obamacare’s Medicaid expansion to states, the administration “has made no attempt to argue that expansion represents the most economically efficient use of those dollars—that the funds could not be better used building bridges, returned to citizens,” or other things. A study released this month raises questions about the very utility and efficiency of Medicaid coverage. The study, from MIT’s Amy Finkelstein, Nathaniel Hendren, and Erzo F.P. Luttmer, used data from an Oregon health insurance experiment—in which some low-income citizens received access to Medicaid and some did not, based on the results of a random lottery—to estimate the utility of Medicaid coverage. They found that beneficiaries valued Medicaid at 20 cents to 40 cents on the dollar; in other words, for every $1,000 the states and federal government spent on health coverage, the average beneficiaries felt like they were receiving goods or services valued at $200 to $400. In response, Bloomberg View’s Megan McArdle asked whether the poor would prefer cash benefits to Medicaid. It seems like a fanciful question; for one thing, programs providing cash benefits—such as the Earned Income Tax Credit—historically suffer from a large incidence of fraud. But say a state wanted to offer residents such a choice. Would the Obama administration allow it? The state waiver program included in Obamacare provides flexibility only to the extent that states provide coverage at least as generous to as many people as the health-care law itself. A state cannot target resources only to certain groups—individuals with disabilities, for example—or provide slimmed-down coverage to some beneficiaries. Under that logic, it seems that if a state wanted to provide residents a choice between a smaller cash benefit and Medicaid insurance coverage, the administration would not permit such a measure—even though, according to the MIT study, the average beneficiary would prefer this outcome, and taxpayers would benefit as well. While the Obama administration talks about its flexibility, that appears to apply only when such flexibility promotes the administration’s objectives. The president said early in his tenure that for too many years “rigid ideology has overruled sound science.” Now, an MIT study shows “sound science” questioning the efficiency and utility of Medicaid coverage for beneficiaries. Will the administration react to this scientific evidence, or will its own ideology prevent the consideration of more innovative, and potentially more effective, policies? In a recent interview with the Des Moines Register, Hillary Clinton outlined several elements of Obamacare that she said she would seek to change as president. Her proposals illustrate how the fiscal impact of the law could increase significantly from what was expected when the legislation passed in March 2010. Among the things Mrs. Clinton cited was “how to fix the family glitch.” In short, if an individual qualifies for “affordable” health insurance through an employer, that person’s family will not qualify for federal insurance subsidies–even if the employer does not offer family coverage or if family coverage is unaffordable for the household. Supporters of the health-care law may call this a “glitch,” but it is far from an unintended consequence. This provision has worked exactly how Congress wrote it into the Affordable Care Act. As I noted in an earlier Think Tank post, the Joint Committee on Taxation outlined the specifics behind this policy in a footnote on Page 33 of a 157-page summary of the law released the week of its passage. While some congressional Democrats have attempted to argue since then that the provision, as codified by the Internal Revenue Service, was “simply incongruent” with the text, or a “wrong interpretation of the law,” the legislative history indicates otherwise. The provision may have harsh consequences for affected families, but its inclusion was deliberate. When Congress considered the legislation in 2010, the bill needed to adhere to President Barack Obama’s September 2009 pledge that it would “cost around $900 billion over 10 years.” But to keep the total cost of insurance subsidies—the “gross cost of coverage provisions” in Table 4 here—under $1 trillion, lawmakers made numerous tough choices. For instance, Congress delayed the start of subsidized insurance from January 2013 to January 2014. Congress increased Medicaid payment rates to improve access—but let that increase expire after two years. To pay for higher levels of upfront spending on insurance subsidies, Congress included provisions that slow their growth after 2019—a back-dated reckoning that future Congresses, and families, will have to contend with. And Congress passed—whether lawmakers knew it or not—the “family glitch” provision. As I wrote in January, undoing all these fiscal constraints will cost money. Mrs. Clinton and other supporters of the law have wish lists of enhanced benefits, but proposals to pay for this new spending have been scarce. Moreover, to the extent that skeptics have likened Obamacare to a subprime mortgage—with “teaser” provisions passed in 2010 and a balloon payment still to come—the long lists of additional spending proposals, with few instances of budgetary restraint, will reinforce those comparisons. Last week, the White House released a report outlining the economic benefits to states of expanding Medicaid. The report continues a line of argument the Obama administration has used in encouraging states to expand Medicaid under the Affordable Care Act, the president’s health-care law. The administration faces several obstacles in attempting to sell this argument to reluctant states. The first is the argument I outlined yesterday—namely, the “poverty trap” exacerbated by several elements of Obamacare. In addition to concluding that the law as a whole will reduce the size of the labor force by the equivalent of approximately 2.3 million full-time workers in 2021, the Congressional Budget Office specifically has found that “expanded Medicaid eligibility under [the law] will, on balance, reduce incentives to work.” For instance, while individuals who exceed the threshold for Medicaid eligibility will likely become eligible for subsidized premiums on insurance exchanges, they would also become subject to thousands of dollars in premium payments and cost-sharing—all because of a potentially small increase in income. CBO has found that these kinds of “cliffs” discourage work. Second, the Obama administration has rejected requests from states to impose work or job-search requirements in conjunction with the Medicaid expansion. While the administration has claimed to offer flexibility to states when it comes to altering the Medicaid benefit, it has steadfastly refused to consider any mandatory work or job-search requirement. Given the CBO’s analysis, the administration faces a rhetorical challenge in explaining how expansion can benefit the economy yet simultaneously reduce incentives to work—particularly as it declines to give states the ability through work requirements to mitigate against those disincentives. Additionally, the White House report solely examines the benefits of increased federal funding to states without examining the source of that funding. Most notably, the health law included more than 18 tax increases, which according to the most recent CBO estimates will raise over $1 trillion in revenue—with obvious dampening effects on state economies. Congressional Budget Office Director Keith Hall testified before the House Budget Committee last week about how dynamic scoring–considering macroeconomic effects of legislative proposals–affects the agency’s work. It could have a major effect on entitlement spending proposals. Most of the debate over dynamic scoring has focused on the economic impact of tax cuts and government spending. Dr. Hall’s testimony highlighted a less discussed but equally important related element: the way that means-tested government programs lower economic growth by effectively raising marginal tax rates. For instance, a single mother making $20,000 per year might pay not only 15 cents in taxes for every additional dollar of income raised; her eligibility for food stamps, Medicaid, and the Earned Income Tax Credit might also be reduced or eliminated. The Urban Institute’s Gene Steuerle has calculated that these programs amount to a “poverty trap” for families of modest means by taking away as much as 80 cents out of every dollar in added income through a combination of higher taxes and reduced government benefits. CBO has conducted two analyses related to Obamacare that showed that the health law would exacerbate this—discouraging work and reducing the size of the labor force. The first analysis, released in August 2010, found that the law would reduce the U.S. work force by about half of one percentage point–the equivalent of approximately 800,000 workers by 2021. The second, released in February 2014, roughly tripled that estimate to 1.5% to 2% of the labor force, or about 2.3 million workers in 2021. I have written previously about CBO’s analysis of the Affordable Care Act and the impact of dynamic scoring under the agency’s previous director, Doug Elmendorf. In his testimony last week, Dr. Hall said that the reduction in government revenues caused by the way Obamacare discourages work is likely to lower the cost of repealing the law. As Dr. Hall noted, these are early days for CBO’s obligations of dynamic scoring for major legislation. But to the extent that debates over dynamic scoring focus on whether tax cuts or economic stimulus measures “pay for themselves” through greater economic growth, they miss an important issue. The poverty trap that government policies have created — and possibly was exacerbated by Obamacare — by providing a disincentive for people to take on initiatives that might raise their incomes impedes economic growth and hinders the ability of millions of Americans to achieve their dreams.